Organizing a budget for your household has never been an easier task. The Household Budget Expenses template will help you perfectly list out all your monthly expenses and help you organize them in such a way to know exactly where your money is going on a daily basis. The free template will also calculate all your expenses to give you a completely accurate total as well. Let’s face it; it can be difficult to keep track of all your daily expenses. You will probably miss a few things along the way. This template is here to make your life a little easier. To receive a free copy of this template, simply click the link provided at the bottom of this page. The next step is to start in the “Household Expenses” tab. 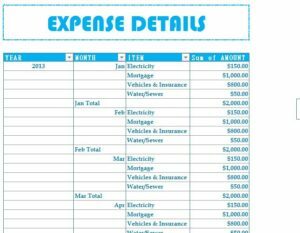 In this section, you can list all your expenses for any length of time. You can easily change any of the examples given by clicking inside a cell and typing something new. You will simply enter the date you purchased your item, then the name of the item, the amount, the year, and finally the month of your purchase. The template will take all the information you enter and compile it in the next tab. When you’re current with all your expenses, proceed to the “Expense Summary” tab. In this tab, you can easily adjust the drop-down menus below to display only certain criteria. For example, if you want to select only expenses for a certain month, you would just click the arrow in the “Month” column and select the month you want. You can see how easy and simple the Household Budget Expenses template will make your daily life. Simply download the free template today and you can make small changes in your life that equate to huge savings over time.